Dinner parties have been the subject of paintings for decades. The depiction of a royal family dining, religious figures gathering, or bar mates sharing a meal have all been sources of inspiration. Dinner parties often like studio visits or art openings are a way to discuss, collaborate and be a part of something greater than just your own work and life. Pierre Bonnard’s Before Dinner (1924) is a timeless offering of an ordinary moment before a meal, one that many of us have seen or felt. Formally, Bonnard delivers a strange scene. Warm hues create a seemingly cold mood, with backs turned letting us know there are words unsaid. I don’t know if I am invited to this dinner or not, but I’d like to be. Bonnard is a master of the everyday scene. He gives weight and attention to subjects and moments most would simply walk past. 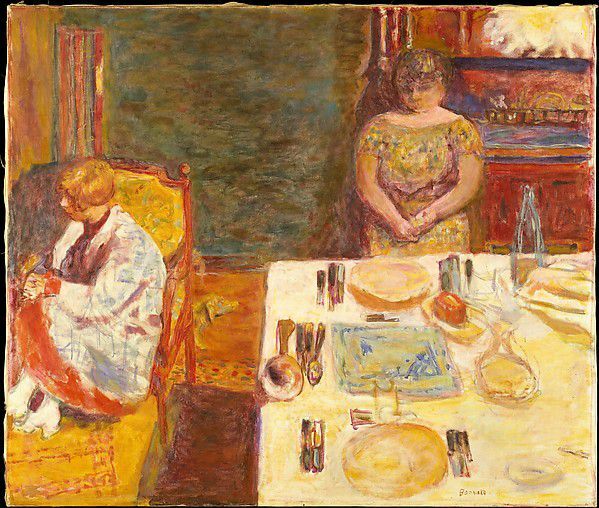 Even in the slight shifts of tone and light, Bonnard indicates feeling and memory; or maybe a moment of tension in Before Dinner, 1924. Perhaps even, this painting depicts women merely resting after a long day of preparation. We aren’t supposed to know it all, I am sure of that – but we are certainly invited to look. I have been fortunate to visit studios for years, of friends and strangers alike. Art openings in New York are never-ending and there is seemingly a constant gnawing to keep up. Perhaps, it is in the moments we convene over a ‘pot-luck’ with friends and strangers that we feel most at ease being ourselves. In my opinion, a good dinner party always has a few constants and thankfully, everyone will bring something different to the table. Often it’s food and wine – but better yet, it’s the wild stories, strange facts or even debates that keep us on our toes. Whatever the case, like most people, I am just thankful to be invited. Some aspects of life don’t change too much. When you are a kid, you want so desperately to be a ‘player’ in the game and to get that nudge from your coach that you belong out there. As you get older, you enter a different sort of game, with new rules and more complex challenges. One thing rings true to me however, regardless of artist’s success or age – everyone wants to be a player in the game. The seemingly huge, complicated and elite art world of New York City is actually made up of people who work consistently and with sincere rigor. There are not 13. There are thousands.